Receptor-type tyrosine-protein phosphatase eta is an enzyme that in humans is encoded by the PTPRJ gene. 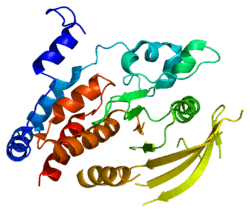 The protein encoded by this gene is a member of the protein tyrosine phosphatase (PTP) family. PTPs are known to be signaling molecules that regulate a variety of cellular processes including cell growth, differentiation, mitotic cycle, and oncogenic transformation. This PTP possesses an extracellular region containing five fibronectin type III repeats, a single transmembrane region, and a single intracytoplasmic catalytic domain, and thus represents a receptor-type PTP. This PTP is present in all hematopoietic lineages, and was shown to negatively regulate T cell receptor signaling possibly through interfering with the phosphorylation of Phospholipase C Gamma 1 (PLCG1) and Linker for Activation of T Cells (LAT). This PTP was also found to dephosphorylate PDGF beta receptor, and may be involved in UV-induced signal transduction. PTPRJ has been shown to interact with CTNND1. ↑ "Diseases that are genetically associated with PTPRJ view/edit references on wikidata". ↑ Ostman A, Yang Q, Tonks NK (Nov 1994). "Expression of DEP-1, a receptor-like protein-tyrosine-phosphatase, is enhanced with increasing cell density". Proc Natl Acad Sci U S A. 91 (21): 9680–4. doi:10.1073/pnas.91.21.9680. PMC 44880 . PMID 7937872. ↑ Honda H, Inazawa J, Nishida J, Yazaki Y, Hirai H (Jan 1995). "Molecular cloning, characterization, and chromosomal localization of a novel protein-tyrosine phosphatase, HPTP eta". Blood. 84 (12): 4186–94. PMID 7994032. 1 2 "Entrez Gene: PTPRJ protein tyrosine phosphatase, receptor type, J". ↑ Holsinger LJ, Ward K, Duffield B, Zachwieja J, Jallal B (Oct 2002). "The transmembrane receptor protein tyrosine phosphatase DEP1 interacts with p120(ctn)". Oncogene. 21 (46): 7067–76. doi:10.1038/sj.onc.1205858. PMID 12370829. Harrod TR, Justement LB (2003). "Evaluating function of transmembrane protein tyrosine phosphatase CD148 in lymphocyte biology". Immunol. Res. 26 (1–3): 153–66. doi:10.1385/IR:26:1-3:153. PMID 12403354. Jallal B, Mossie K, Vasiloudis G, Knyazev P, Zachwieja J, Clairvoyant F, Schilling J, Ullrich A (1997). "The receptor-like protein-tyrosine phosphatase DEP-1 is constitutively associated with a 64-kDa protein serine/threonine kinase". J. Biol. Chem. 272 (18): 12158–63. doi:10.1074/jbc.272.18.12158. PMID 9115287.
de la Fuente-García MA, Nicolás JM, Freed JH, Palou E, Thomas AP, Vilella R, Vives J, Gayá A (1998). "CD148 is a membrane protein tyrosine phosphatase present in all hematopoietic lineages and is involved in signal transduction on lymphocytes". Blood. 91 (8): 2800–9. PMID 9531590. Tangye SG, Phillips JH, Lanier LL, de Vries JE, Aversa G (1998). "CD148: a receptor-type protein tyrosine phosphatase involved in the regulation of human T cell activation". J. Immunol. 161 (7): 3249–55. PMID 9759839. Gross S, Knebel A, Tenev T, Neininger A, Gaestel M, Herrlich P, Böhmer FD (1999). "Inactivation of protein-tyrosine phosphatases as mechanism of UV-induced signal transduction". J. Biol. Chem. 274 (37): 26378–86. doi:10.1074/jbc.274.37.26378. PMID 10473595. Autschbach F, Palou E, Mechtersheimer G, Rohr C, Pirotto F, Gassler N, Otto HF, Schraven B, Gaya A (2000). "Expression of the membrane protein tyrosine phosphatase CD148 in human tissues". Tissue Antigens. 54 (5): 485–98. doi:10.1034/j.1399-0039.1999.540506.x. PMID 10599888. Billard C, Delaire S, Raffoux E, Bensussan A, Boumsell L (2000). "Switch in the protein tyrosine phosphatase associated with human CD100 semaphorin at terminal B-cell differentiation stage". Blood. 95 (3): 965–72. PMID 10648410. Kovalenko M, Denner K, Sandström J, Persson C, Gross S, Jandt E, Vilella R, Böhmer F, Ostman A (2000). "Site-selective dephosphorylation of the platelet-derived growth factor beta-receptor by the receptor-like protein-tyrosine phosphatase DEP-1". J. Biol. Chem. 275 (21): 16219–26. doi:10.1074/jbc.275.21.16219. PMID 10821867.
del Pozo V, Pirotto F, Cárdaba B, Cortegano I, Gallardo S, Rojo M, Arrieta I, Aceituno E, Palomino P, Gaya A, Lahoz C (2000). "Expression on human eosinophils of CD148: a membrane tyrosine phosphatase. Implications in the effector function of eosinophils". J. Leukoc. Biol. 68 (1): 31–7. PMID 10914487. Baker JE, Majeti R, Tangye SG, Weiss A (2001). "Protein Tyrosine Phosphatase CD148-Mediated Inhibition of T-Cell Receptor Signal Transduction Is Associated with Reduced LAT and Phospholipase Cγ1 Phosphorylation". Mol. Cell. Biol. 21 (7): 2393–403. doi:10.1128/MCB.21.7.2393-2403.2001. PMC 86872 . PMID 11259588. Persson C, Engström U, Mowbray SL, Ostman A (2002). "Primary sequence determinants responsible for site-selective dephosphorylation of the PDGF beta-receptor by the receptor-like protein tyrosine phosphatase DEP-1". FEBS Lett. 517 (1–3): 27–31. doi:10.1016/S0014-5793(02)02570-X. PMID 12062403. Ruivenkamp CA, van Wezel T, Zanon C, Stassen AP, Vlcek C, Csikós T, Klous AM, Tripodis N, Perrakis A, Boerrigter L, Groot PC, Lindeman J, Mooi WJ, Meijjer GA, Scholten G, Dauwerse H, Paces V, van Zandwijk N, van Ommen GJ, Demant P (2002). "Ptprj is a candidate for the mouse colon-cancer susceptibility locus Scc1 and is frequently deleted in human cancers". Nat. Genet. 31 (3): 295–300. doi:10.1038/ng903. PMID 12089527. Holsinger LJ, Ward K, Duffield B, Zachwieja J, Jallal B (2002). "The transmembrane receptor protein tyrosine phosphatase DEP1 interacts with p120(ctn)". Oncogene. 21 (46): 7067–76. doi:10.1038/sj.onc.1205858. PMID 12370829. Strausberg RL, Feingold EA, Grouse LH, Derge JG, Klausner RD, Collins FS, Wagner L, Shenmen CM, Schuler GD, Altschul SF, Zeeberg B, Buetow KH, Schaefer CF, Bhat NK, Hopkins RF, Jordan H, Moore T, Max SI, Wang J, Hsieh F, Diatchenko L, Marusina K, Farmer AA, Rubin GM, Hong L, Stapleton M, Soares MB, Bonaldo MF, Casavant TL, Scheetz TE, Brownstein MJ, Usdin TB, Toshiyuki S, Carninci P, Prange C, Raha SS, Loquellano NA, Peters GJ, Abramson RD, Mullahy SJ, Bosak SA, McEwan PJ, McKernan KJ, Malek JA, Gunaratne PH, Richards S, Worley KC, Hale S, Garcia AM, Gay LJ, Hulyk SW, Villalon DK, Muzny DM, Sodergren EJ, Lu X, Gibbs RA, Fahey J, Helton E, Ketteman M, Madan A, Rodrigues S, Sanchez A, Whiting M, Madan A, Young AC, Shevchenko Y, Bouffard GG, Blakesley RW, Touchman JW, Green ED, Dickson MC, Rodriguez AC, Grimwood J, Schmutz J, Myers RM, Butterfield YS, Krzywinski MI, Skalska U, Smailus DE, Schnerch A, Schein JE, Jones SJ, Marra MA (2003). "Generation and initial analysis of more than 15,000 full-length human and mouse cDNA sequences". Proc. Natl. Acad. Sci. U.S.A. 99 (26): 16899–903. doi:10.1073/pnas.242603899. PMC 139241 . PMID 12477932. Dong HY, Shahsafaei A, Dorfman DM (2003). "CD148 and CD27 are expressed in B cell lymphomas derived from both memory and naïve B cells". Leuk. Lymphoma. 43 (9): 1855–8. doi:10.1080/1042819021000006385. PMID 12685844. Kellie S, Craggs G, Bird IN, Jones GE (2004). "The tyrosine phosphatase DEP-1 induces cytoskeletal rearrangements, aberrant cell-substratum interactions and a reduction in cell proliferation". J. Cell. Sci. 117 (Pt 4): 609–18. doi:10.1242/jcs.00879. PMID 14709717. Massa A, Barbieri F, Aiello C, Arena S, Pattarozzi A, Pirani P, Corsaro A, Iuliano R, Fusco A, Zona G, Spaziante R, Florio T, Schettini G (2004). "The expression of the phosphotyrosine phosphatase DEP-1/PTPeta dictates the responsivity of glioma cells to somatostatin inhibition of cell proliferation". J. Biol. Chem. 279 (28): 29004–12. doi:10.1074/jbc.M403573200. PMID 15123617.